One of the refrains of the French presidential campaign was the suggestion by Nicolas Sarkozy that the French presidency is not an office for the “normal” man his challenger François Hollande claimed to be. Indeed, it’s fair to say that Hollande won despite, not because of, the reputation he had cultivated as Socialist party leader for the previous eleven years. (The cruel nickname “Flanby,” from the brand name of a quivering custard dessert, speaks volumes.) The French presidency, with its extraordinary powers reflecting the national emergency in which it was born, was expressly designed not for “normal” politicians, but for immense historical figures of the stature of Charles de Gaulle, the former general, leader of the French resistance and providential founder of the Fifth Republic. Hollande had a different model in mind, however: François Mitterrand, who was president of France from 1982 until 1995—and the man who gave Hollande his start in politics by offering him a presidential staff position the year after graduating from the highly selective École Nationale d’Administration. After emulating Mitterrand’s rhetorical style on the campaign trail, Hollande in his first days in office has taken another leaf from Mitterrand’s book, imposing his own cautious stamp on the complexion of the new government. IN MANY RESPECTS Mitterrand is not at all an obvious model for the Socialist candidate of 2012. The two men were cut from very different cloth. Mitterrand saw himself (plausibly, if not without exaggeration) as an aesthete, a literary stylist, a philosopher of history, and a man acutely aware of his own historical standing. (Of course, at the time he was elected 1981, the mere fact of a leftist winning power and inviting Communists to join his government was considered an historical achievement.) Hollande, by contrast, had attended business school before turning to public life. He was a pragmatist with a head for economics, a subject that Mitterrand not only detested but also distrusted. Moreover, by the time he left office, Mitterrand’s reputation was quite tarnished, not least among his own party. His tenure was marred by several notable scandals, and a book published in his final year in power revealed the previously unknown fact that he had received a medal from Marshal Pétain. (To be sure, he had also worked for the Resistance, but the concealment of his Vichyite past tarnished his reputation.) When his anointed successor, Lionel Jospin, ran (unsuccessfully) for the presidency in 1995, he invoked a droit d’inventaire with regard to Mitterrand’s legacy—a right to pick and choose which aspects of the Mitterrand presidency should form the basis of future policy. Still, Mitterrand’s presidency imparted one lesson that Hollande seems eager to heed. It can be stated in a word: Caution! Mitterrand’s first two years in office ended in debacle. Having unified the habitually warring Socialists and Communists around a bold “Common Program” of nationalizations, a higher minimum wage, a shorter work week, more generous social spending, and a tax on wealth, he quickly faced resistance. “Socialism in one country” was not in the cards two years after Margaret Thatcher had begun turning Britain upside down and five months after Ronald Reagan arrived in Washington with guns blazing. By 1983 Mitterrand was therefore forced to beat an ignominious retreat. To characterize the turn in Socialist policy at that juncture, the newspapers chose a word that is once again resounding across the continent: rigueur—French for austerity. The ubiquitous but vague term “growth” has served mainly to conceal, rather than clarify, Hollande’s ultimate economic intentions. As Merkel was only too happy to acknowledge, growth is a broad concept with which everyone can agree. The real issue is what one is willing to do, and to spend, in order to achieve it. Sarkozy said back in 2007 that he would “seek growth with his teeth.” Hollande, less given to vivid imagery, seems to be counting mainly on the European Investment Bank in the short term and on education, to which he devoted his major inauguration day speech, in the long run. Neither idea, it bears repeating, qualifies as a bold revision of the current austerity regime. The same is true of many of the domestic proposals Hollande has made: They sound progressive but fall short of an unambiguous commitment. He says he will roll back Sarkozy’s reform of the French pension system, but if you look at the details, you see his proposals exempt only a small number of people from the increase in the early retirement age from 60 to 62. 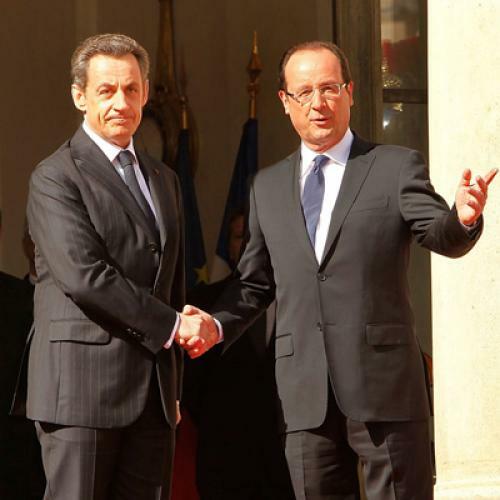 Hollande’s first appointments as president show the same caution. His choice for prime minister, Jean-Marc Ayrault—the leader of the Socialist group in parliament and a close personal confidant for many years—is respected, but somewhat colorless, and prudent to a fault. More relevantly, perhaps, he is a German expert, someone who began his career as a teacher of German in a public high school before becoming mayor, like Hollande, of a provincial city. Ayrault was the consensus choice for the post, the one least likely to exacerbate tensions within the Socialist Party and most likely to facilitate the difficult discussions ahead with Germany. Equally significant is the fact that Martine Aubry, the current party leader, was not chosen. (Apparently miffed that she was not offered the premier post, she has announced that she will not join the government at all.) As the favorite of the party’s left wing, Aubry would have alarmed the Germans and international credit markets. Hollande, then, has chosen to start his presidency in the manner of Mitterrand after his first two turbulent years: very quietly and cautiously. It is an open question, of course, whether such prudence will be up to the current challenge. If Hollande’s quiet diplomacy doesn’t change the dynamic of Europe’s economic meltdown, a social explosion across the continent is inevitable. Hollande’s incrementalism is explained by the fact that he doesn’t want to foment disorder. But, right now, it’s much more likely that a lack of action will cause Europe’s undoing. Arthur Goldhammer is an affiliate of the Center for European Studies at Harvard University. He blogs on French politics at http://artgoldhammer.blogspot.com.